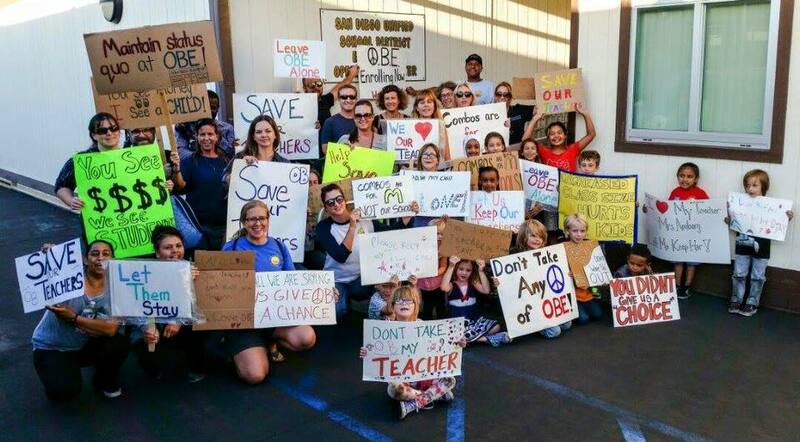 OB turns out at the school board meeting, Oct. 6, 2015. Photo by Staci McAteer. Here are the OBceans who attended the San Diego Unified School Board meeting yesterday, Tuesday, Oct. 6th. They were there to protest the transfer of 2 teachers from OB Elementary. Some of those we are at the school board meeting: John McAteer, Gretchen Newsom, Clayton Connolly, Jessica Pearson Connolly, Marianne Reiner, Jessica Cuevas Plummer and Kristoffer Newsom. Could it be that the drop in student enrollment (specifically Kindergarten) is because Ocean Beach School is a terribly mismanaged school? Could it be that families with special needs kids left because of the disaster with Ocean Beach’s special education department? Could it be that families left because of how terrible and mean some of the office staff are to parents? Could it be that families left because Ocean Beach school is not a secure campus? Yes, vacation rentals and higher rents are driving families out of OB, but I would take a much closer look at how that school is managed. Maybe, someone should interview the teachers and staff privately and ask what they think about school management.